What exatly is a bruise ? Bruises are formed when blood leaks from the capillaries in the various layers of the skin into the surrounding area. This is seen as red colouration on the skin and can be raised and nearly always painful initially. How Do Bruises Form ? Bruises result from a trauma to the skin, which causes the blood vessels to leak into the surrounding area. 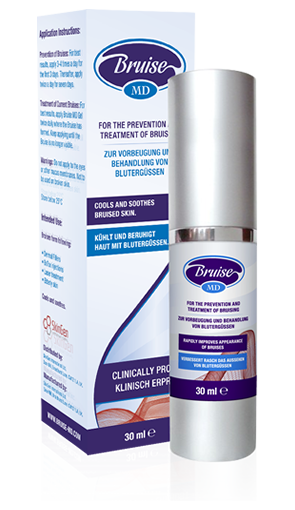 Bruises appear particularly with accidents, injections or operations and these can be prevented or minimized with a simple application of Bruise MD™ after the procedure or accident. Bruises can appear quite raised where the damage to the area causes inflammation as well as the bruise. This is called a contusion. Or alternatively, the bruise can be flat, but with the same level of discoloration. This iscalled an ecchymosis. Both contusions and ecchymosis are the result of blood leaking into the tissue from damaged blood vessels. The degree of damage to the area normally dictates the size and severity of the bruise, but some patients are more susceptible to bruising because of their age or other medicines that they take. • Trauma. A blow to the skin will cause the leaking of small capillaries into the surrounding skin. • Operations or medical interventions can cause bruising. Raw Steak is often said to be a cure for bruising. Who hasn’t seen a film with an actor with a steak over their eye. The only effect that the steak will have is to cool the area. iv Cohen J;The Role of Topical Vitamin K Oxide Gel in the Resolution of Post procedural Purpura; J Drug Derm; 2009; 8: 1020-1025.
vi Seely BM. Denton AB. Ahn MS, etal. Effect of homeopathic Arnica M’ontana on bruising in face-lifts:results of a randomized, double-blind, placebo-controlled clinical trial. Arch Faccial Plat Surg. 2006; 8:54-59.